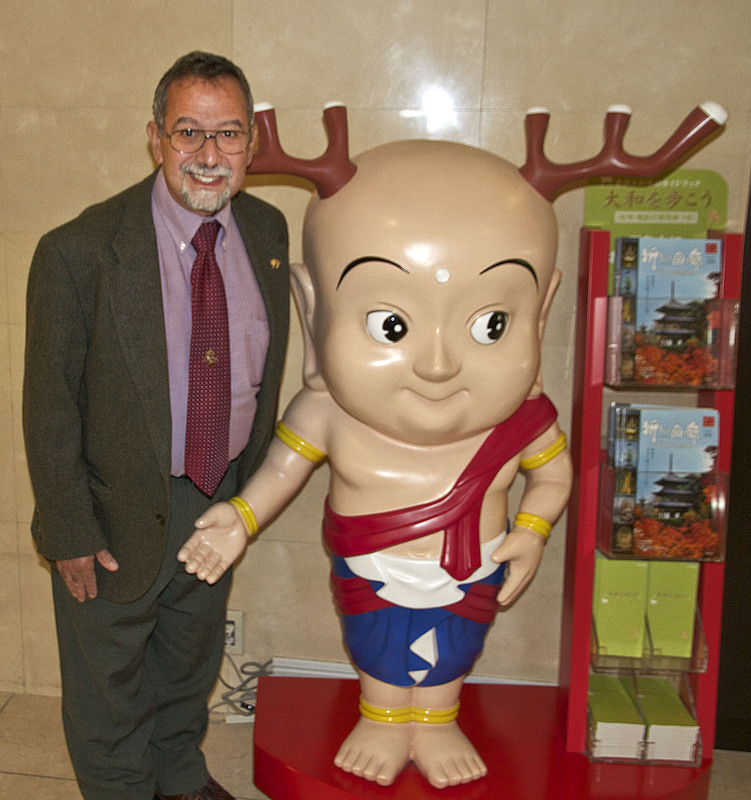 My friend in the hotel lobby. 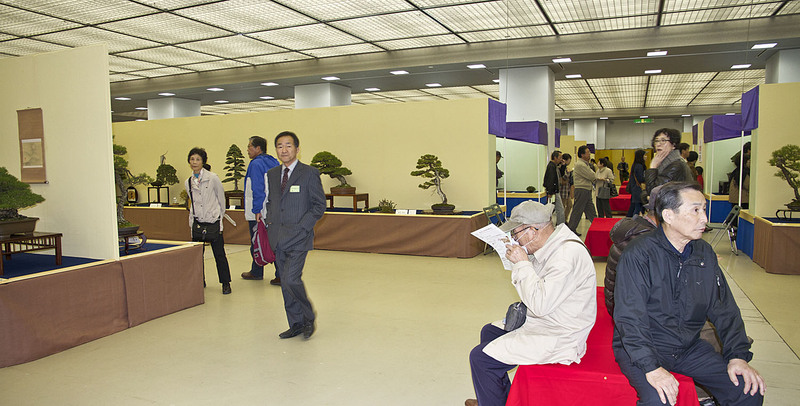 On Saturday morning we went to the opening of the Choseki Kai Suiseki Exhibition before heading on to the Taikan Bonsai Exhibition. We actually got there at 9am and the show opened at 10, so it was a quiet time to appreciate, study and photograph the stones and displays. 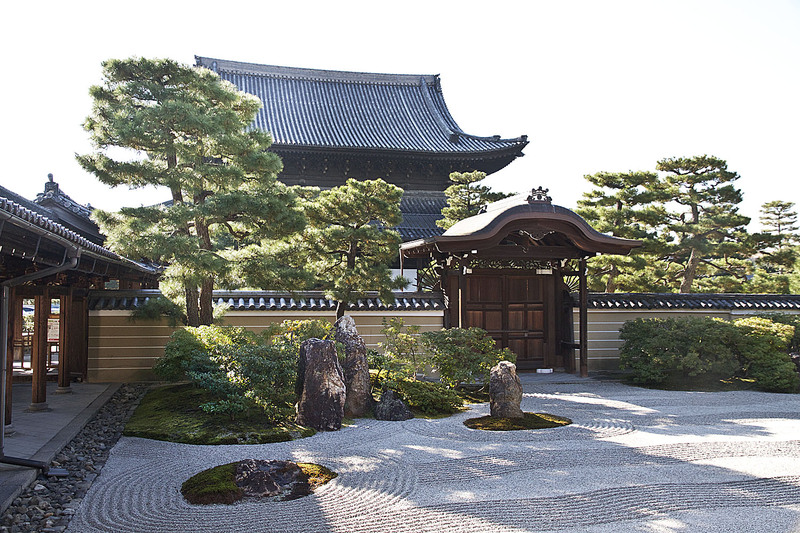 The suiseki exhibition is annually held at the Kenniji Temple, the 800 year old Buddhist Temple, oldest in Kyoto. 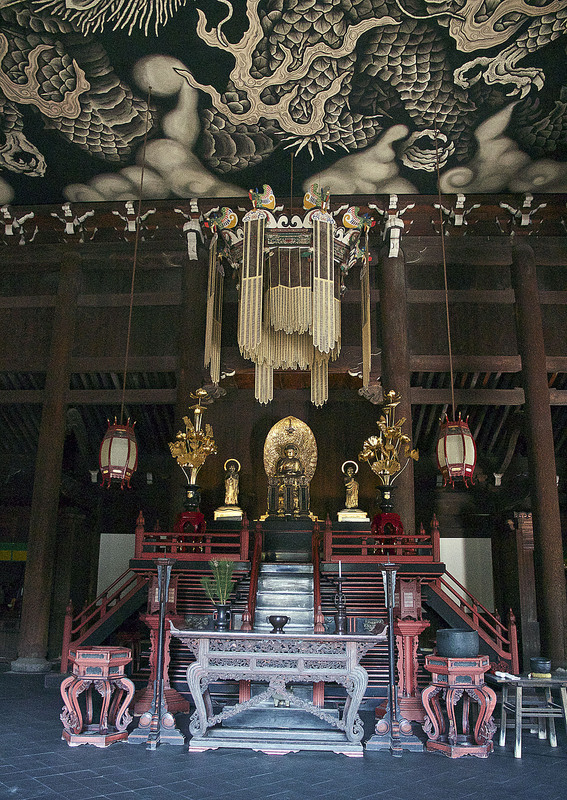 The old buildings are beautiful and unique, as are the ancient paintings and other art. Seiji Morimae, S-Cube in Hanyu, is the prime organizer of the event, and, as usual, did a smashing job with the show. 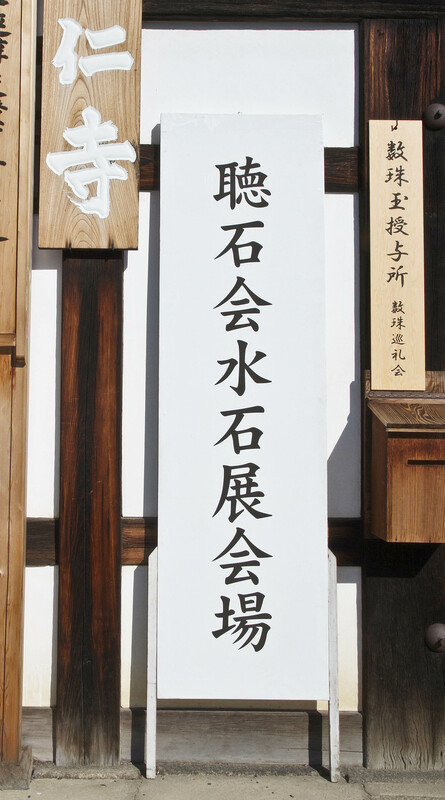 There were three full wall formal tokonoma each displaying one susiseki and a grass planting companion. The other stones were displayed along the walls on dark blue felt runners. Several interesting grass plantings were used as accents. The display tables were equally as beautiful. Having the stones displayed on the floor level means that to fully appreciate the suiseki, one must sit on the floor. This is also true when photographing. It was easier for me to sit down, then scoot around on my knees. But, there was one magnificent stone I had to get down on my belly, flat on the Tanami mat to photograph. 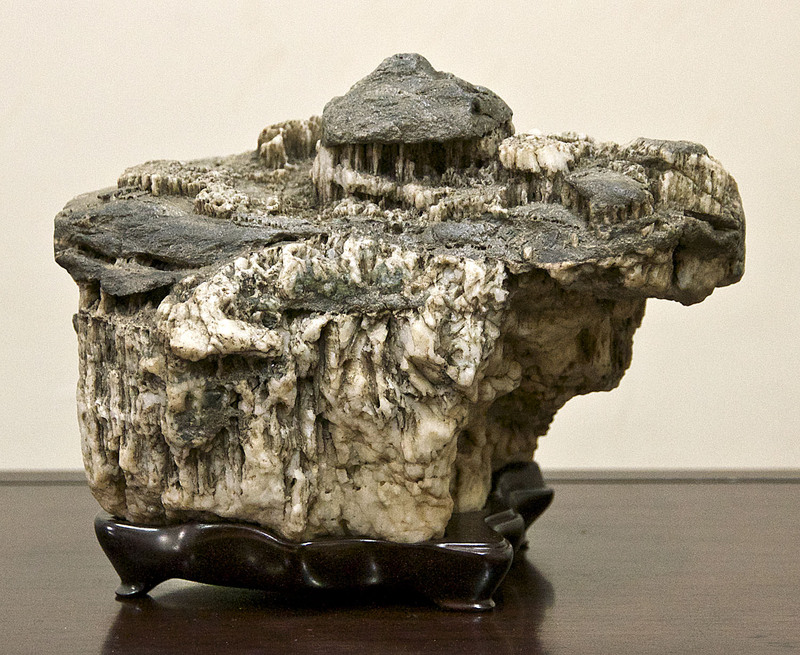 On the top of the stone was a natural hut. 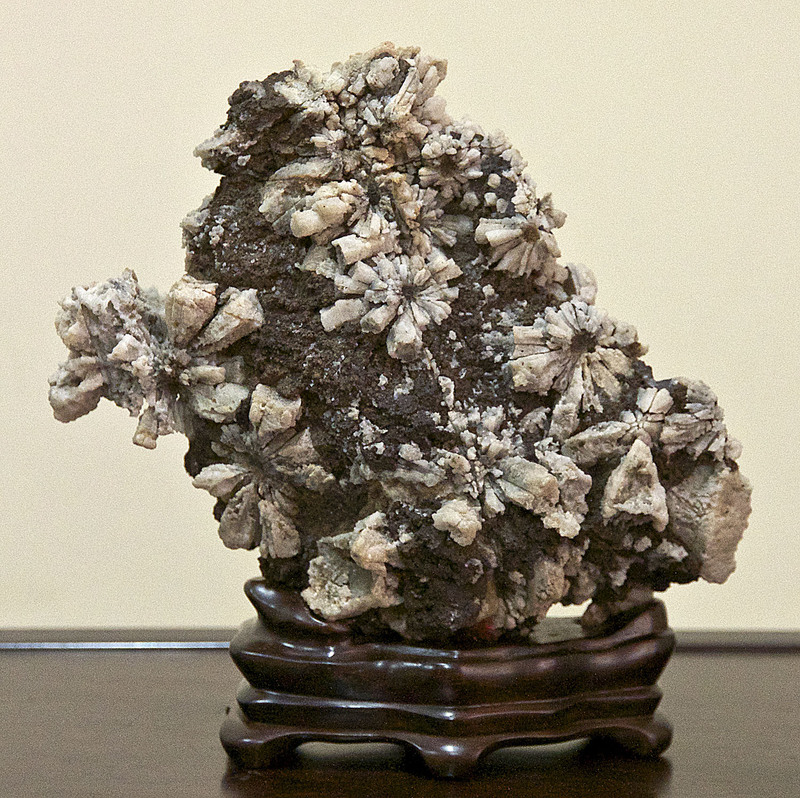 Another stellar stone had exposed crystals which presented the feeling of chrysanthemum blossoms. 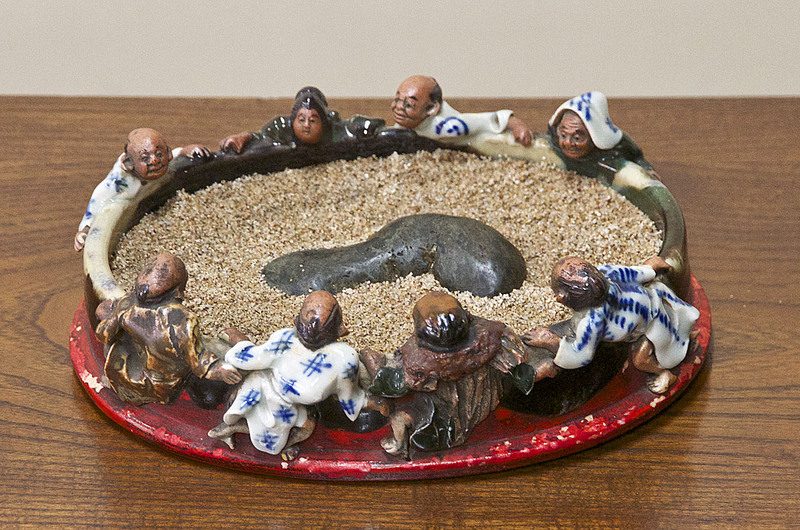 And, finally, a small suiseki was displayed in water basin with people sitting all around looking at the stone. 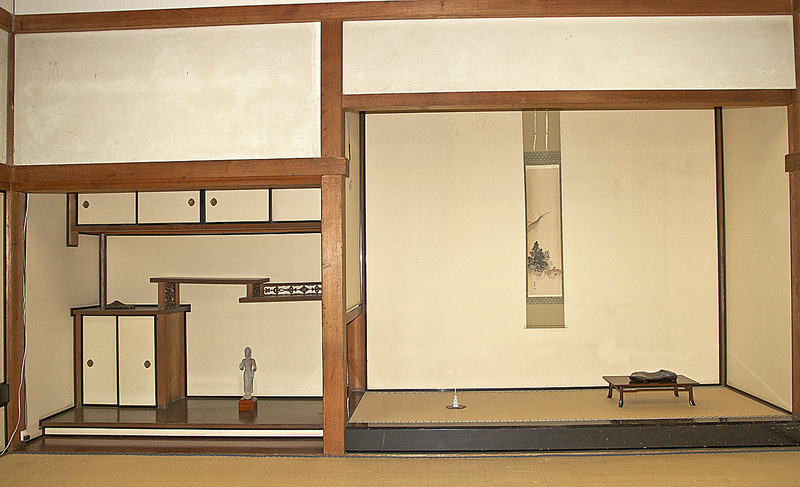 I don’t quite understand this display, but could not find Mr. Morimae to explain this to me, but I will in February. I’m sure he will remember. After enjoying the other buildings and gardens we took a taxi back to the bonsai exhibition where we stayed until we were exausted around 3pm. 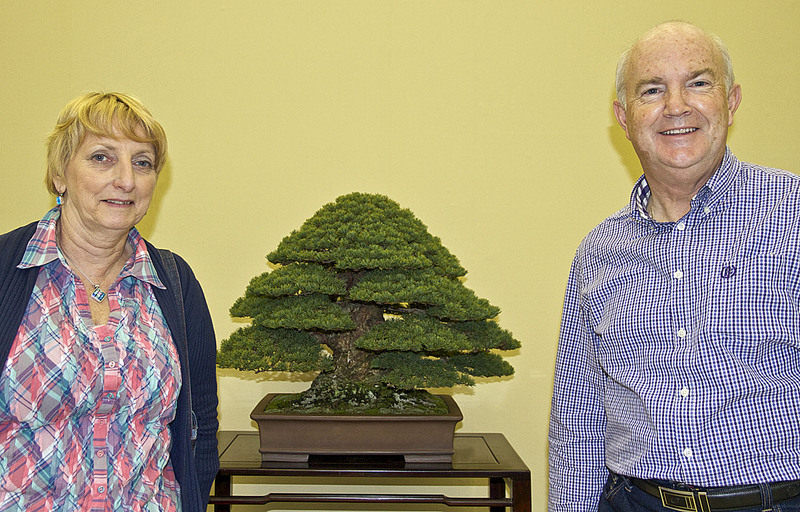 At the exhibition I saw Rita and Marc Cooper from England who were displaying a great Kokonoe Japanese five-needle pine which was being cared for at the Fujikawa Kouka-en Bonsai Garden in Osaka. This is the garden where Bjorn and Owen Rich are studying. In fact these two were at the show from set up until take down tomorrow. 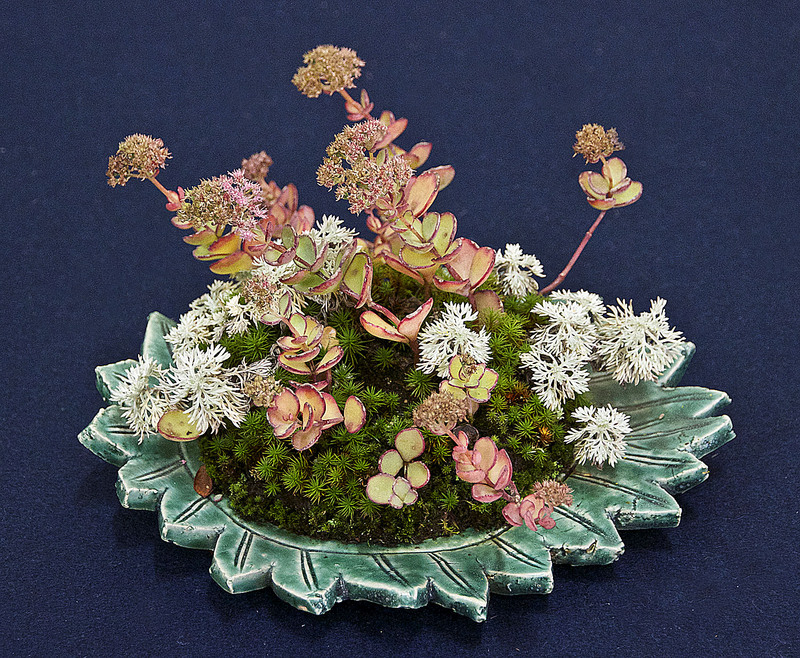 They assist their teacher Keiichi Fujikawa answering questions, running around, serving tea and selling bonsai to visitors, especially foreigners. 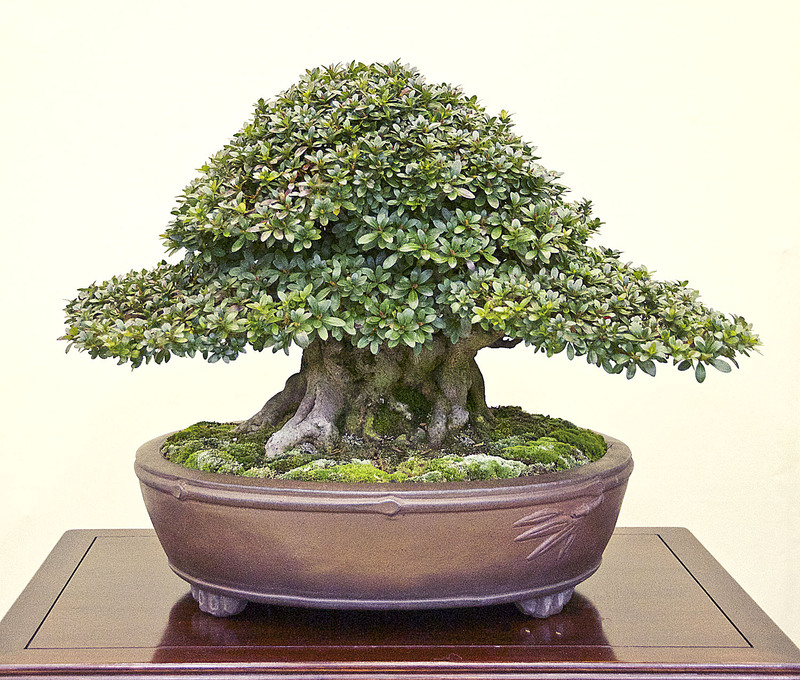 On our final walk through I’d like to share a few superb bonsai for sale in the vending area. 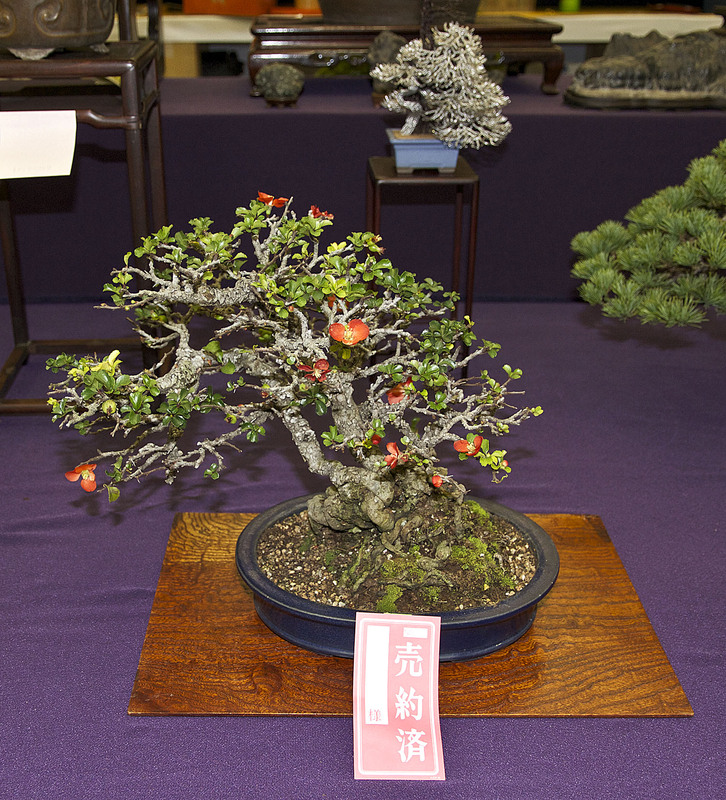 There was a beautiful Chojubai Japanese flowering quince with rough bark. 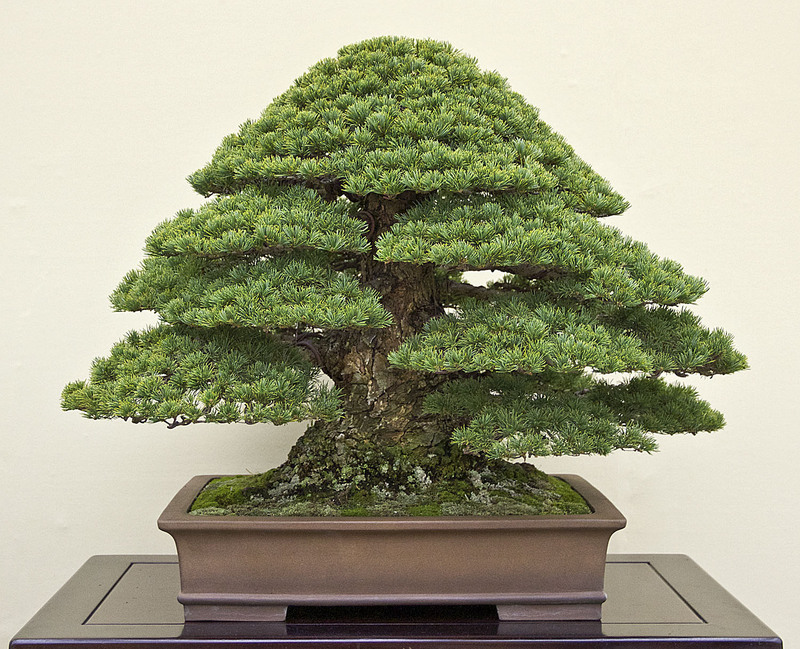 A comprehensive article on this species is forthcoming for International BONSAI. 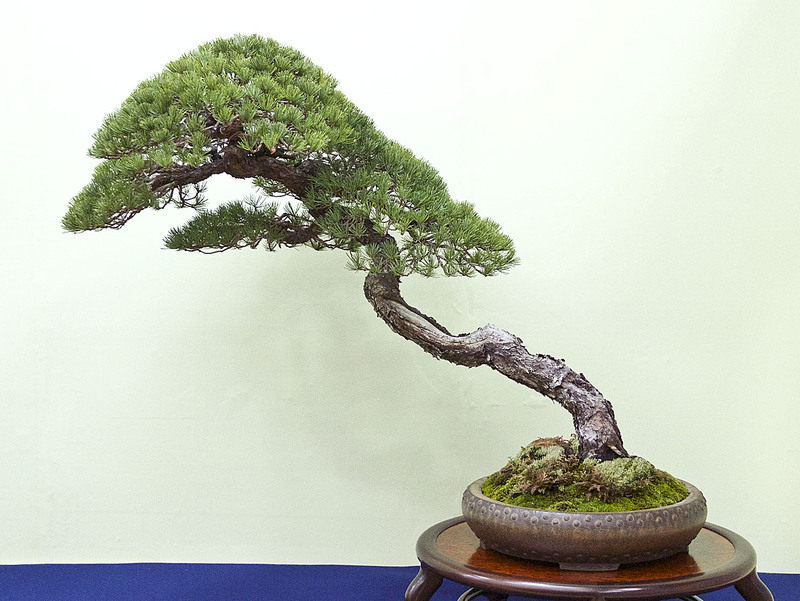 For sale, near this bonsai is an ancient Sargent juniper bonsai. 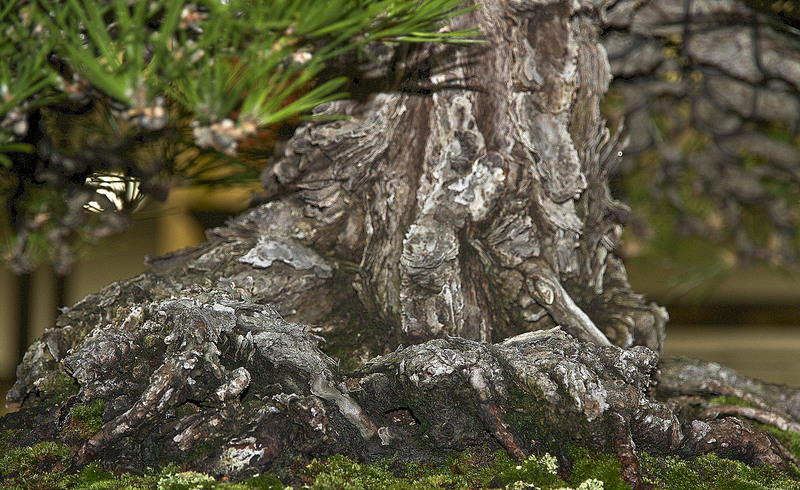 Although there are numerous “similar” appearing old Sargent juniper bonsai full of dead wood and lush green foliage, this bonsai is quite different. 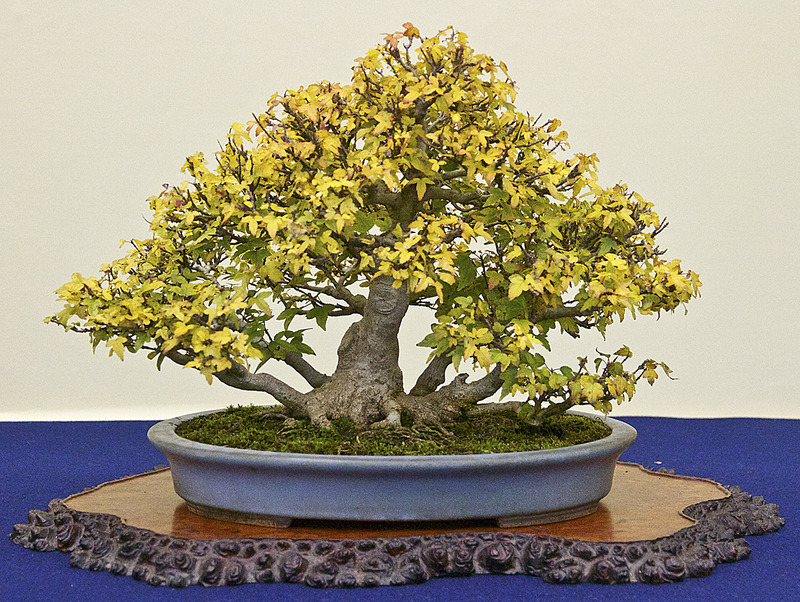 Like many of the specimens, all the branches are grafted on to the living trunk sections to replace the foliage with a cultivar with a fine-texture foliage. 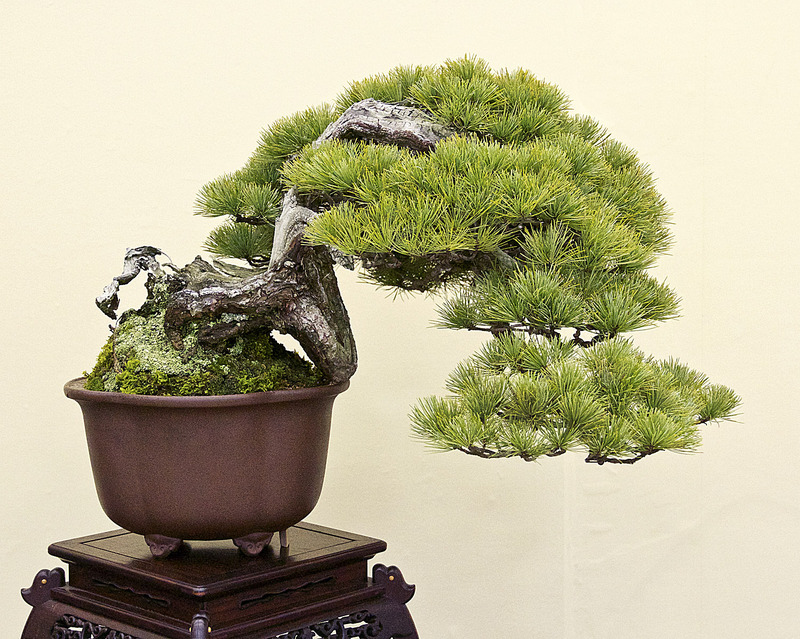 This bonsai is different and more refined as depicted with the branching as can be seen on the bottom right. It’s not just a bush, the branch has detail and shows many, many years of loving, dedicated and skilled training. 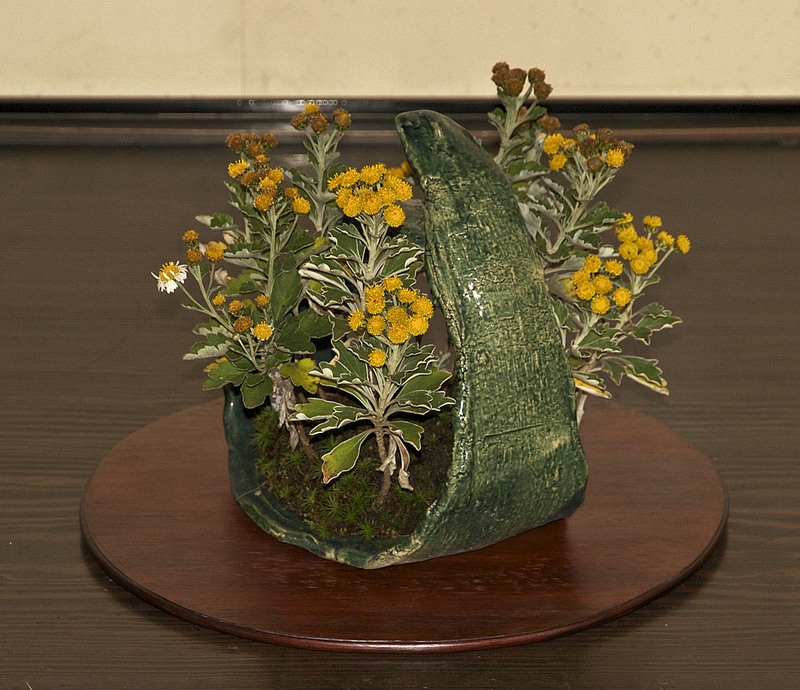 This is not the first time I’ve seen this bonsai as it was also for sale at the Ueno Green Club in Tokyo during the 2013 Kokufu Bonsai Exhibition, also by the same artist. I just happen to have a photo from February and check out the upper foliage pads. They were still in training not as tightly pinched as the tree is now. Also, the old photograph shows the tree in it’s winter color. 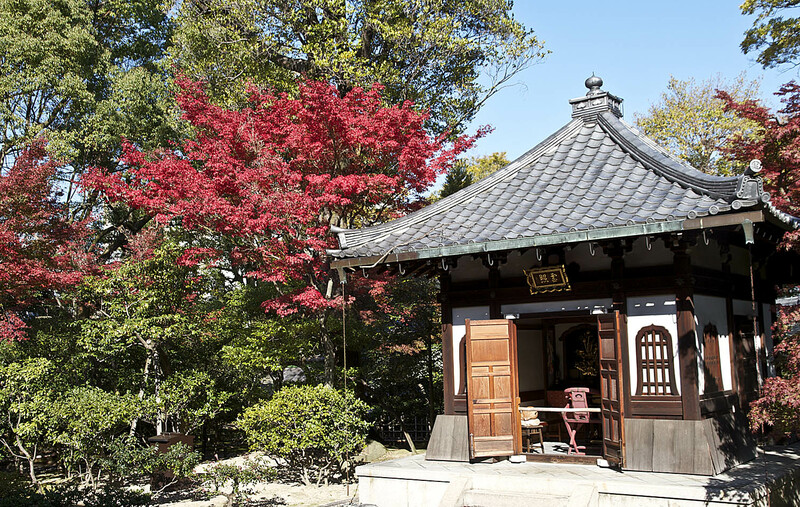 During the late afternoon I met Yasuo Mitsuya, Tokai-en Bonsai Garden, which was good because I wanted to present him with a copy of my newest book. 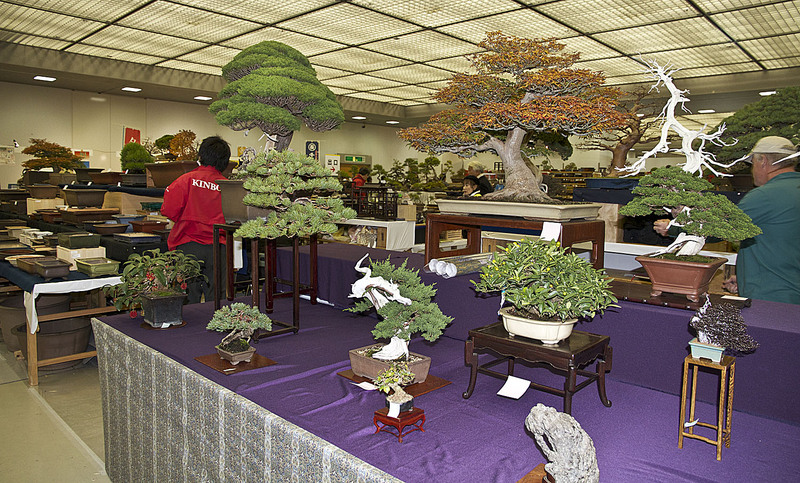 Mr. Mitsuya was one of the three international judges and a demonstrator at the 2012 3rd U.S. National Bonsai Exhibition held in Rochester, New York. 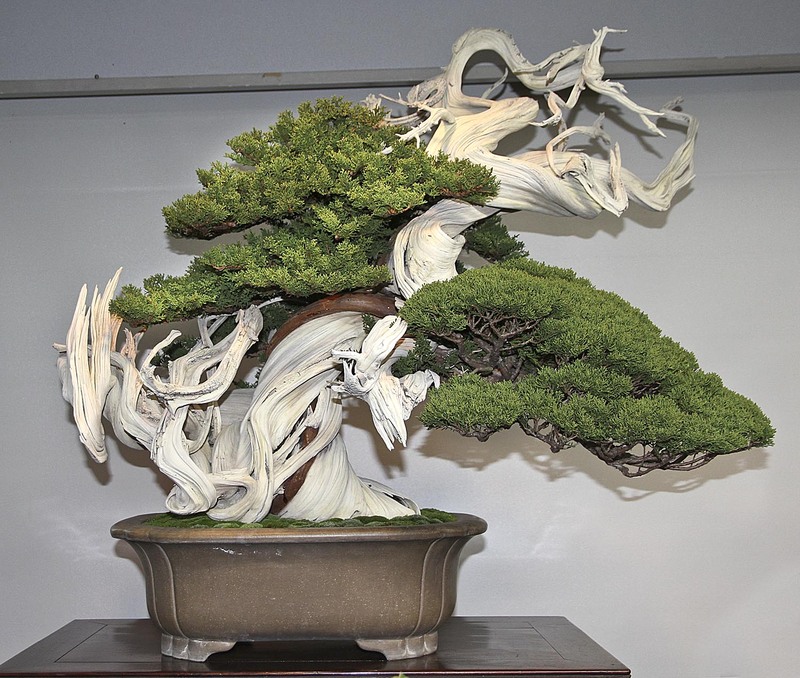 He gave me a photo of a fine bonsai he was selling through his prior apprentice’s sales area. 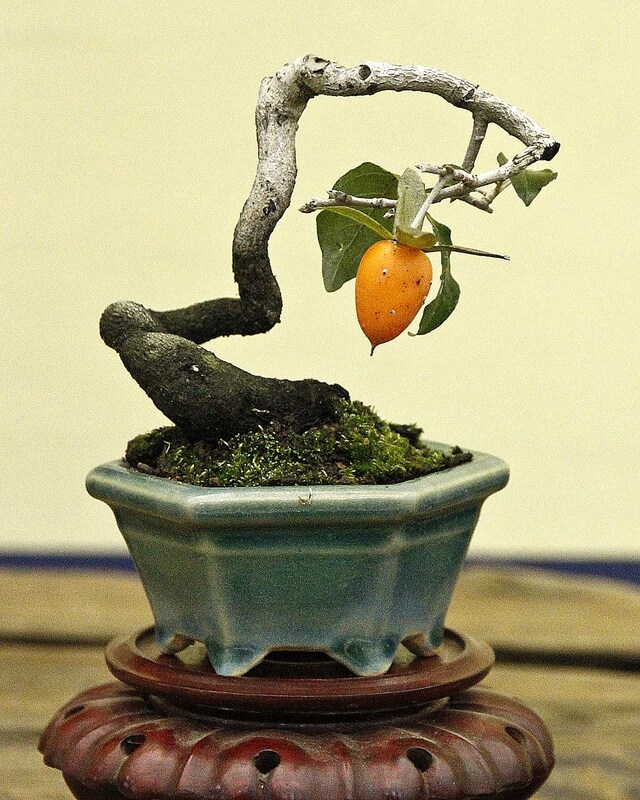 I showed this bonsai in the last blog entry, but now it has a different meaning. 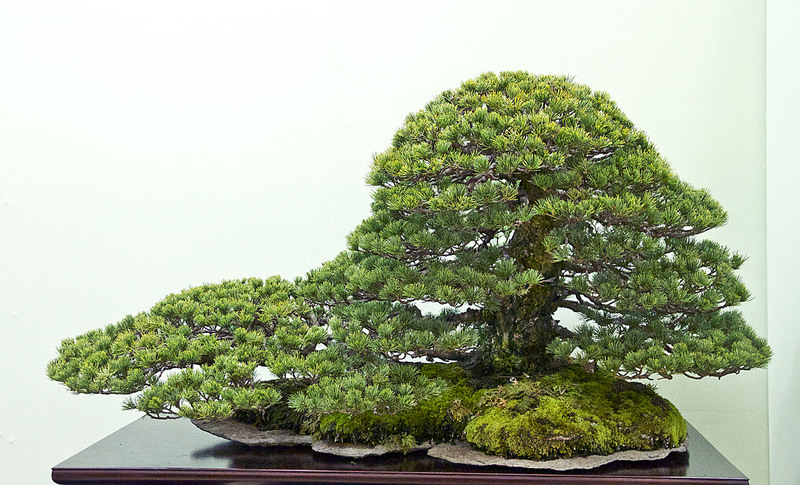 Mr. Mitsuya has been training his Japanese black pine bonsai for over 35 years and was trained from a collected tree. He mentioned that it must be over 250 years old, but did not start it from seed. The bark is quite aged. He then told me the price, and to be certain I got the right number of zeros, I had him check it on my handy iPhone currency exchange app. 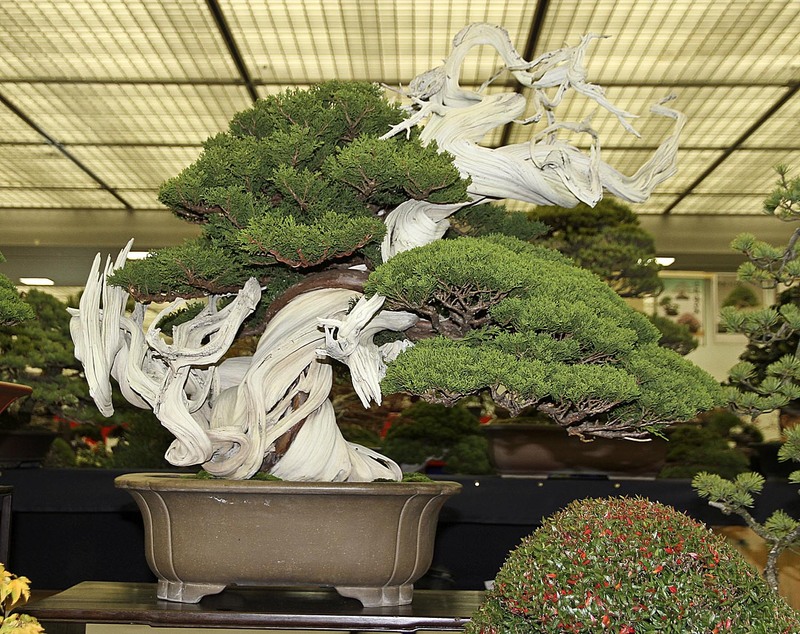 So, if you would like to add this bonsai to your collection (if you could get it into your home country) the price is US $120,000. The tree was still for sale. Thanks for sending Part 5. The stones were unusual and beautiful. I bet that Mark and others in the Suiseki club would have enjoyed seeing them. It was 17F in my yard this morning. We had a light show fall last night — just enough to cover the lawns. Reblogged this on DangerousBry's Blog.